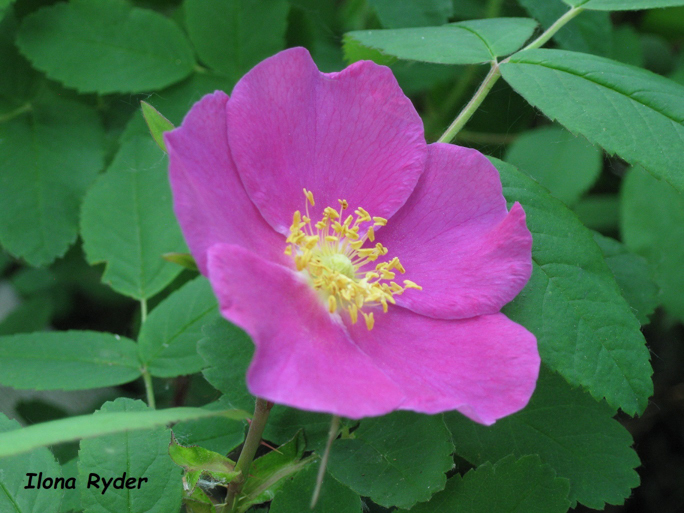 Prickly Rose (Rosa acicularis), the floral emblem of Alberta, is one of three wild rose species that grow in our region. The common or thorny wild rose (Rosa woodsii) and the dwarf prairie rose (Rosa akansana), found mainly in the Waterton Park area, are the other two. In our region, the three species may grow together and sometimes interbreed. Two distinguishing features of the prickly rose are: single rather than clustered flowers, and spiny stems throughout (i.e. prickly). 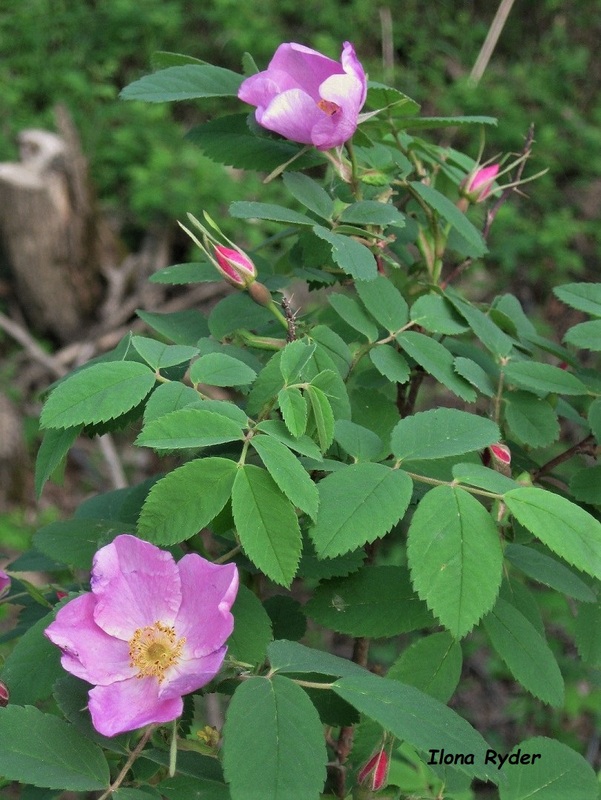 The Rosa woodsii has fewer thorns and they occur at the nodes (Johnson et al. 58, Gadd 277). When the prickly rose blooms in late spring we see and smell the typical fragrance of the pink five-petalled flowers. A special treat is seeing half-open buds and fully-open roses all gracing the same stem. Fully-open roses show a deep pink petal that is almost white at the center, where a cluster of yellow stamens attracts insects. The toothed leaves grow in bunches of seven or nine, remain green until late fall when scarlet pear-shaped or fully round and fleshy fruit—the rose hips—start to form. 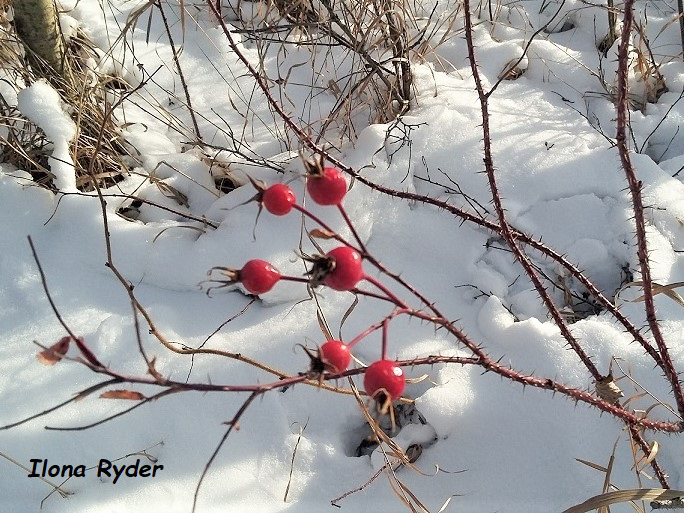 Rose hips stay all winter and can provide important survival food for wildlife. Found along trails, road and field edges, and in open aspen forest, this ubiquitous shrub can be as short as 30 centimeters in dry open areas, and stretch to 1.5 meters tall in wooded areas. 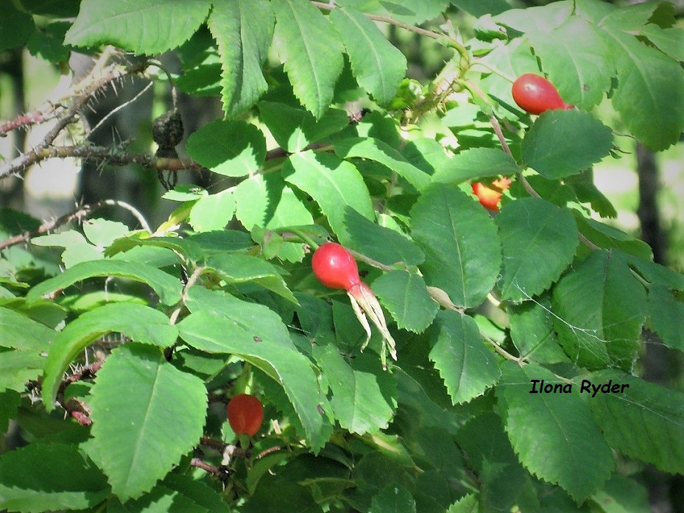 You can enjoy this fragrant companion along the trails in June and early July; in October and November, you can snack on a few rose hips as you go by. “Three rose hips are said to contain as much Vitamin C as a whole orange” (Johnson et al, p 58). Be sure to spit out the seeds, though, as the little hairs covering them are an irritant to our digestive system.